From Australia, this balikbayan comes home to be a forest defender. But eventually, he also turned to be a reluctant entrepreneur. 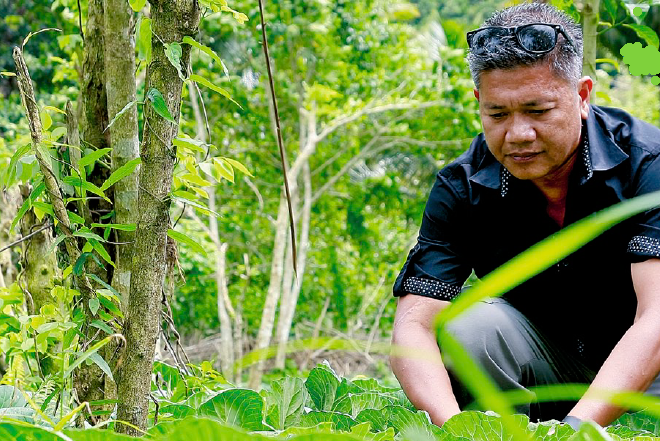 In the valley between the mountains of Banahaw and San Cristobal in Quezon, a green enterprise has taken root, thanks to balikbayan Dion Pullan, who donned the hat of a businessman—albeit reluctantly—in a bid to defend the mountains’ forests. “I’m not a businessman,” insists the 55-year-old. 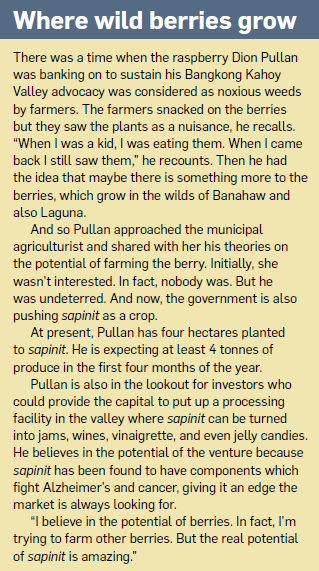 But Pullan’s advocacy to protect the forests led him to venture into organic farming and the hospitality business to provide livelihood to residents in the area to wean them from depending on forest resources to feed their families. Pullan is standing his ground on the 21 hectares of land he inherited from his great grandfather at the heart of Dolores, Quezon, called the Bangkong Kahoy Valley. 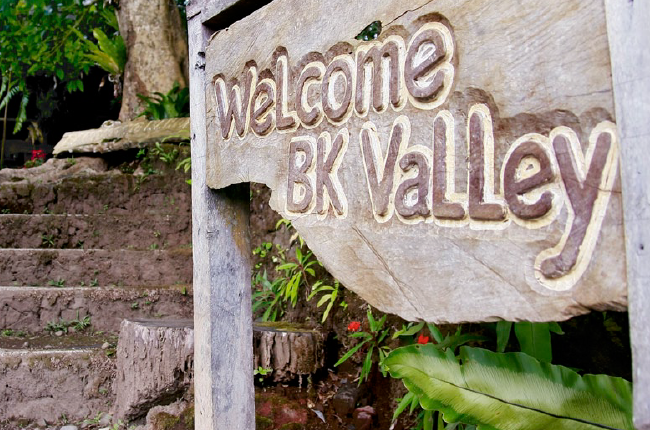 Now, Pullan runs a nature retreat called the BK Mountain Lodge as well as an organic farm, which supplies produce not only to the local community, but also to restaurants in Manila, as well as resorts in Batangas. He also opened a hotel, which he hopes will bring in more visitors to the valley. 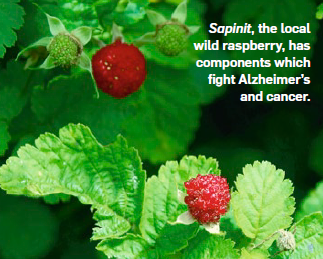 He and the farmers in the area also grow sapinit, the local wild raspberry, and plan to produce enough so they could eventually process the berries into finished goods. He feels the sapinit venture is key to making the entire operation financially sustainable. Part of this plan is to set up a food processing facility in the area so the produce he and the other farmers grow—not just sapinit—can be processed into finished goods. Before Pullan’s great grandfather passed away, he left one request to the family: whatever happens, even if the family has to bite the bullet, never sell Bangkong Kahoy Valley. Those were strong words that would tail Pullan even when he lived in Australia. The words eventually led him back to the valley in 2006 to what he described as a “God-forsaken place” when he was still a kid. What prompted him to come back? “It was the love for nature,” Pullan explains. He adds that at the time, the valley and the forests were under threat and he wanted to stop the spiral. Despite his siblings calling him crazy because he uses his hard-earned money in running a seemingly losing operation, Pullan is unfazed. “They never saw what I’m seeing,” he beams with pride and points to Mts. Banahaw and San Cristobal. They’re “together in harmony” and should be protected, he says. That’s why part of his advocacy is to convince the farmers in the area to shift to organic farming and stop the use of harmful pesticides and chemicals. Now, he has a give-and-take relationship with the farmers. He lets them use his land for a minimal lease. In turn, they abide by his condition of refraining from using pesticides and chemicals. Pullan also wants to see farmers, who he sees as the “the poorest of the poor,” become less dependent on middlemen. This is why he wants the farmers to be able to sell their produce directly to the end buyers and at the price they want. Pullan says he’s been practicing organic farming on his land for four years now. And already the forests are the better for it. For instance, he says, birds flit around the forests once again. “They weren’t here when I first arrived because of the heavy use of chemicals and pesticides,” he says. Aside from farming, Pullan is providing livelihood to residents through the mountain lodge and the hotel he built with the help of lawyer Ramon Quisimbing of the Quisumbing, Torres Law Firm. The lodge offers a retreat for trekkers, mountaineers or vacationers and is run like a resort, with the farmers and their families serving the guests. “I brought up trainers from TESDA [Technical Education and Skills Development Authority] because I want the residents to learn the proper way of serving people,” he says. “After a year or two, I can give them certificates and they can jump on board cruise ships.” Once they come back, as they eventually will, they will be in a better position to help the community, he adds. Pullan plans on coming up with other forms of livelihood for the residents. He even plans to do a survey to find out what residents in the communities around the valley are good at, with the idea of eventually providing them a means of livelihood. While making money is not his goal, Pullan realizes his green enterprise needs money to be sustained. That’s why he’s also looking for like-minded investors—people or businesses who believe it’s worth it to save the mountains’ forests. “In the end, it’s the forest that wins,” he says. This article was originally published in the March 2013 issue of Entrepreneur magazine. Subscribe to the print or digital version here.